In one simulation, a lethargic, fevered little girl is treated for septic shock with her treatment team consulting with specialists over video-conference. No one was at risk, as all the patients that day were mannequins, specifically designed for medical simulation training. At another station, learners were able to practice fundamental skills like laparoscopic surgery technique and placing a central line with the help of ultrasound. Other stations allowed participants to observe and practice a wide range of skills, which will benefit all kinds of healthcare providers across Niagara Health. These are just two of the eight different scenarios presented at the Simulation Kick-Off event held at Niagara Health on Sept. 19. This unique learning opportunity was presented by the Development & Education in Simulation Inter-professional Group of Niagara (DESIGN). DESIGN represents a collaboration between Niagara Health and McMaster University’s Michael G. DeGroote School of Medicine, and is focused on immersive medical education through simulation. "Our academic partnerships are a terrific example of how we can provide opportunities for our healthcare professionals to enhance their skills, in this case using advanced educational technology," said Niagara Health President Dr. Suzanne Johnston. "The scenarios take place in real time and are very realistic. 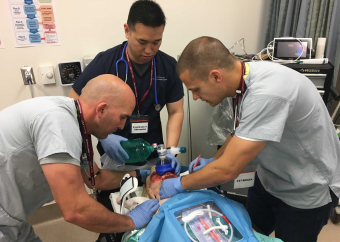 Simulation education gives our learners a unique opportunity to train in the moment and in a safe environment and receive direct and immediate feedback." "This is a showcase of what options exist in simulation. There are a lot of people interested in education, patient safety and quality improvement and there is a use for simulation in that venue," said Dr. James Beecroft, a Niagara Health Emergency Department physician and Regional Education Lead – Emergency Simulation Lead at McMaster University’s Michael G. DeGroote School of Medicine. "As a training and learning technique, simulation is always well received by our students. It is an immersive and safe environment where patients are not put in risk." "This is a great educational opportunity for me," said Stacie Thomas, a registered nurse on medical telemetry at Niagara Health. "I’m interested in learning more, especially for emergency situations. It’s good for me to be able to observe hands-on situations." The day also featured a keynote address from Dr. Matthew Sibbald, Director of McMaster University’s Centre for Simulation-Based Learning, entitled "Safe Mistakes: What is Simulation and Why Do It?" "Simulation is a wonderful, safe zone for us as healthcare practitioners to practice before we poke," said Dr. Sibbald. "It’s important for our teams and organizations to learn well in advance of putting a patient in our hospital." Simulation helps learners hone their clinical skills, their decision-making, their communication abilities and their resource management. It puts them in a very realistic, dynamic, changing environment without putting any patients at risk. This kind of training is invaluable in Niagara Health’s ongoing commitment to learning, continuous improvement, and providing extraordinary care.